Need Some Ideas For Inexpensive Centerpieces? Ideas for Inexpensive Centerpieces that are lovely and won't cost you a fortune. OK, your resources are limited and you are planning your wedding on a shoestring. My tips and ideas will help you create fabulous table arrangements without blowing your budget. This inexpensive, unique centerpiece idea is so beautiful; no one will know how little it cost. Save your mayonnaise or canning jars, go to a craft or fabric store and purchase foil paper or fabric. Wrap the foil or fabric around the jar and tie a ribbon around the rim of the jar. Fill the container with fresh flowers from the supermarket or your garden. 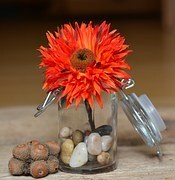 Another Mason Jar centerpiece idea is shown below. Of course you can substitute the flower to match your color scheme, use colored glass instead of rocks and surround the bottom of the jar with sand, confetti, etc. You get the idea. Ideas for inexpensive centerpieces that are versatile if you don’t want to use fresh flowers – fill the container with branches and leaves or for a more party atmosphere, place some sand or rocks in the jar and tie balloons to the rim of the jar. This centerpiece was created by a bride who purchased lanterns at a close out sale and placed a large candle in the center. 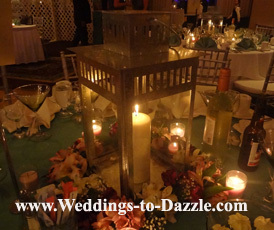 For the head table she placed a wreath of fresh flowers and votive candles around the lanterns. Great centerpiece, with little cost. Candles create a romantic mood and if you use scented candles you have a glorious aroma in your room with soft lighting. Wrap ribbon around the center of your candle; tie the ribbon into a bow and using a glue gun, place rosettes and a string of small pearls in the middle. Depending upon your theme and color scheme you can set the candle on ivy, leaves, or rose petals. Another idea that will enhance your candle centerpiece is to surround the candle with stones or glass chips purchased at the dollar store. Wreaths dress up and add elegance to any table arrangement. Again, go to the dollar store, purchase a glass container, float a flower in water and then place a wreath around the container. 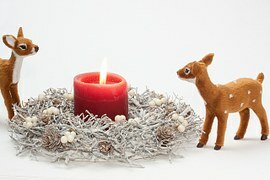 This wreath is very versatile, you can substitute the reindeer and color of the candle to compliment your wedding theme. Examples: You can switch out the reindeer for hearts for a Valentine's theme or shamrocks for a St. Patrick's theme, Snowflakes for a winter theme. An inexpensive fall/autumn centerpiece can be created by carving out two pumpkins and have one resemble a bride by placing a veil on top of one of the pumpkins and a top hat on the other. Purchase an inexpensive dish or container, place a small potted plant in the center and then surround the plant with stones or marbles. Placing the arrangement on a mirror or lace doily and then putting votive candles around the centerpiece can enhance any of the above wedding centerpieces. These are just a few inexpensive centerpiece ideas. Your imagination and creativity will guide you in designing your perfect table arrangement. Remember, it is not how much you spend on your decorations; it’s the look that you want to create that’s important. 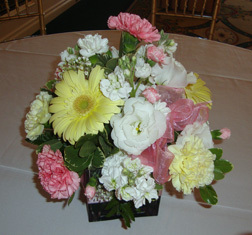 Take a look at the links below if you would like more ideas for inexpensive centerpieces. Need more ideas? Take a look at my opening page.